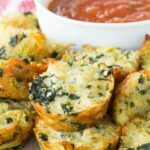 An easy, healthy appetizer or snack recipe with spinach, artichoke hearts, quinoa, and three kinds of cheese. 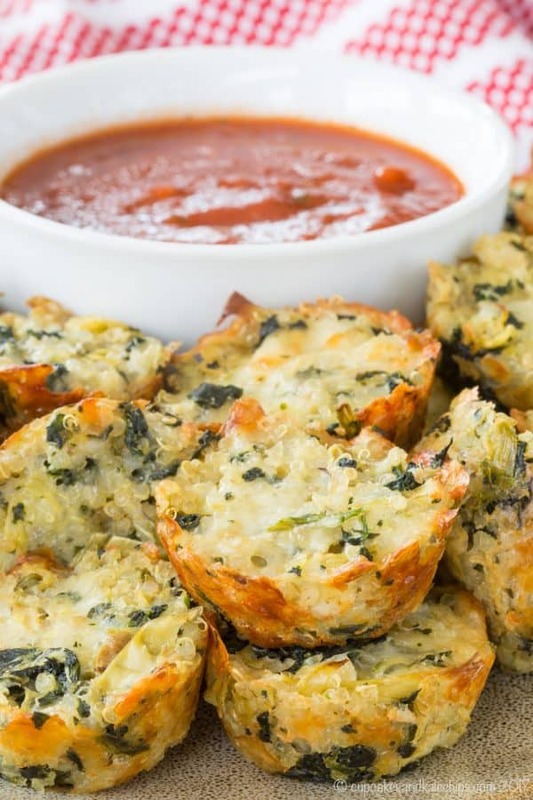 Spinach artichoke quinoa bites with three kinds of cheese turn your favorite hot spinach artichoke dip into a healthy, whole grain finger food for gluten free appetizers or an easy snack. 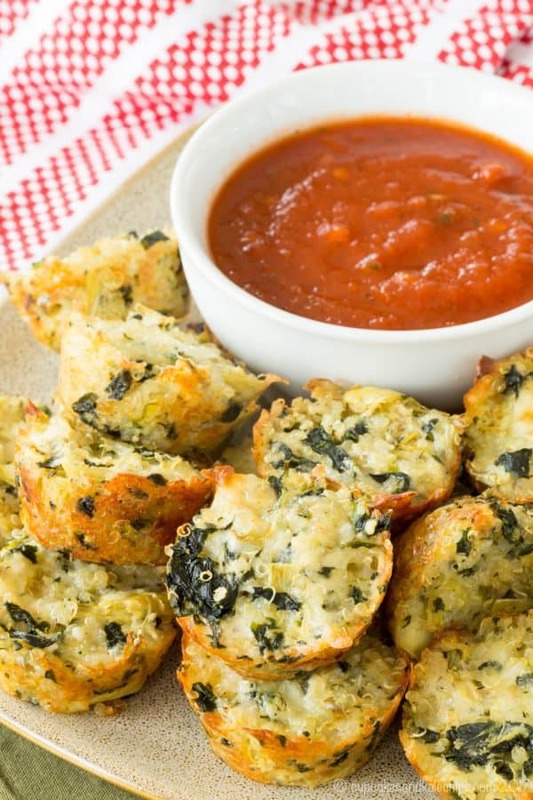 Heat up some tomato sauce for dipping these Cheesy Spinach Artichoke Quinoa Bites. I’m trying to come to terms with the fact that we are homebodies. And not just homebodies. We are happy homebodies. I see people running around to seventeen different sports and activities every week, day trips and outings and overnights away every weekend, squeezing in movies and dinners at restaurants after school, and I feel like I am doing something wrong. Especially because I’m the daughter of a mom who was pretty much all about perpetual motion. If she wasn’t bringing me to dance or Girl Scouts or keyboard lessons (shout out to my fellow 80s kids), then she was doing her cheerleading coach or student council advisor activities at the school where she taught, and more often than not I was with her. And she loves to shop, so weekends were often spent at malls, craft shows, or nice outdoor shopping places, even if we didn’t spend a dime. Do you know what we did the past few Saturdays? Absolutely nothing. Well, to be fair, a few Saturdays ago was New Year’s Eve and three-quarters of us were sick and eating Butternut Squash Soup and sipping on a Cold Toddy Whiskey Mule (well the second one was just me – no whiskey for the kiddos!). And the other Saturdays it’s not like we were not doing anything at all. I was putting away Christmas decorations, purging closets, filming videos, and such. My kids were playing. Just playing. Good as gold, happy as clams. And I’m trying to be ok with that instead of feeling bad that we weren’t hosting playdates or dinners for friends, going to the Smithsonian, or whatever. We were all just home. Doing our thing. And nobody seemed to mind or care or want to be anywhere else. And you know what? That’s totally fine. Or I’m at least going to keep convincing myself it’s fine. 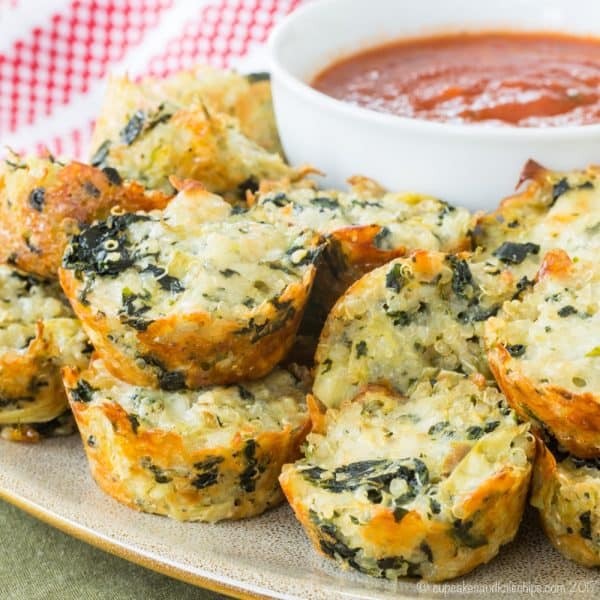 Cheesy Spinach Artichoke Quinoa Bites are a great game day appetizer, after school snack, or even a dinner side dish. You’ve got the usual suspects in classic spinach artichoke dip – spinach, artichoke hearts, and three kinds of cheese – mixed up with cooked quinoa and an egg to stick it all together. The one key, though, is making sure you’ve squeezed as much of the excess moisture out of both the thawed spinach and canned artichoke hearts as possible before you stir everything together. 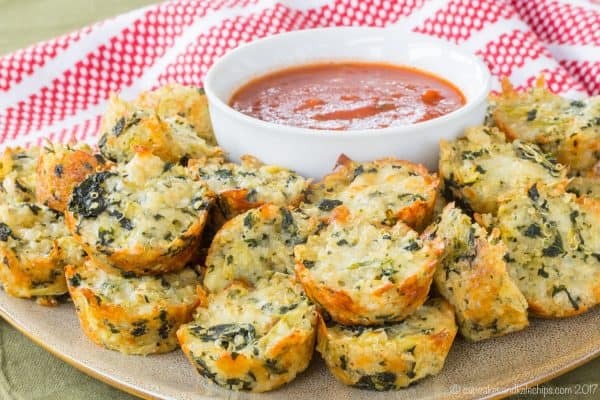 Then just pack the mixture into a mini muffin tin and bake till you have golden, crispy little bites perfect for dipping in tomato sauce and popping right in your mouth. 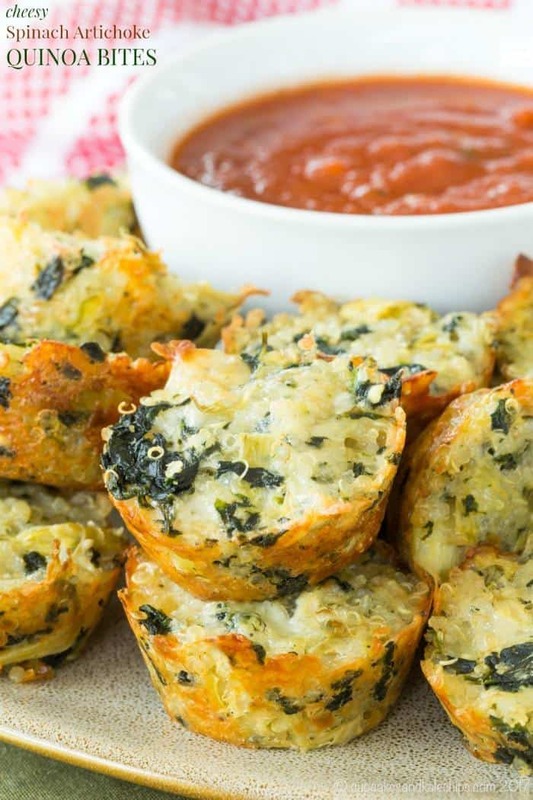 Even the pickiest of eaters won’t be able to resist all the cheesy finger food fun. Preheat your oven to 350°F. Spray a mini muffin tin with cooking spray or oil. Add all of the ingredients to a bowl and mix until thoroughly combined. Divide the mixture evenly between the cups of the mini muffin tin, and press down to pack it in firmly. Bake for 20-25 minutes, or until golden brown and crispy. Let cool for a couple minutes before loosening from the pan with the tip of a butter knife. Can these be made ahead, frozen and reheated? Absolutely, Sheryl. Just be sure to wrap them when they’re cool. I suggest wrapping them in a layer of plastic wrap with a layer of aluminum foil around that. Put them into the fridge to thaw the night before you want to reheat them and you should be good to go! I’m sorry, I have not tried that. I’d think it would work, but you’d lose the crispy edges so I’m not sure the piddle pieces would hold together too well. Hi. I can’t wait to try these! I am making them for my greeting card making club. Thank you so much for the idea!!! Love the recipe! Added a few seasonings and just a small amount to not over power. SO. FREAKING. GOOD!!! Made these for dinner tonight. Yummy! I changed the recipe just a little. I added 1/4 red bell pepper, 2 green onions, 1 very small clove of garlic and didn’t add any salt. With all the cheese I felt there would be enough salt in the recipe. I also used fresh spinach. That was what I had on hand. I warmed some marinara sauce but after one I switched to cocktail sauce and salsa to see which we liked the best. My thought is it depends on how I feel at any different time. Next time I may also try guacamole. This was our dinner with a side salad. Thank you for the recipe. 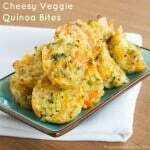 Brenda, your substitutions and additions to the quinoa bites recipe sound amazing! I’m so glad that you enjoyed the recipe. Thank you for your comment and recipe rating! Do you think these would still be good reheated? I want to make them for an office potluck, but I would need to make them the day before. Thanks! Yes, I actually like them a little extra crispy! Haha! No worries. Thank you for your comment and feedback on the muffins. These deserve 5 *. I added some scallions to them the second time I made them. they are so good. I cant imagine them getting only 2*. This is a keeper, love them. What dipping sauce did u make to go with it? Gabby, I served the quinoa bites with a simple spaghetti/marinara sauce. Not near as good as they look ???? Sorry you didn’t like them. Do you have any specific feedback? Hello! 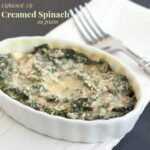 Can I use fresh spinach for this recipe, or is it important to use thawed frozen? I already have fresh spinach on hand, but I’m wondering if there is something unique about the texture of frozen that makes it better for this. Thanks!! Hi Andrea! I used frozen spinach because I wanted to be able to remove the excess moisture so they would hold together, and to ensure no uncooked bits of spinach (which my kids don’t like). If you wilt fresh spinach and squeeze out the moisture it might work, but I haven’t tried it. I love all the quinoa recipes I’ve been seeing lately! It’s one of my favorites and so versatile! (P.S. Sorry you got hit with negativity – your blog is beautiful, and I love what I’ve seen!) Thanks so much for linking up with us at Funtastic Friday! Thanks so much for your sweet comment, Liz! We make quinoa quite often, but I’ve never made them into bites. These sound yummy! Thanks for linking up with Merry Monday last week. Any recipe with spinach has my vote. This looks amazing. Going to pin it under Appetizers. The ads are obnoxious & cover content. They move as the screen does. I just wanted to see the recipe to see what ingredients and I had to go through a crud load of pictures (same one again & again of the recipe Cooked) and ads, ads, & more ads! Ugh! Won’t come back to your site. You annoying. I am sorry you feel that way. My ad program aligns with many others in the industry. And if you don’t like photos, then you probably shouldn’t look for recips on food blogs because many of us do like to take and display photos.